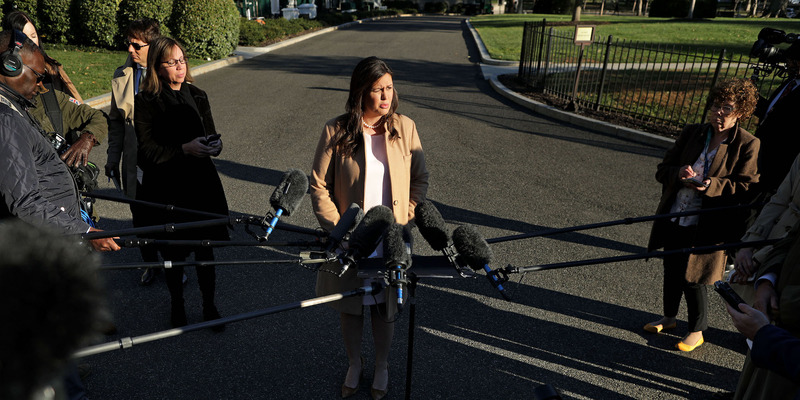 Chip Somodevilla/Getty ImagesWhite House press secretary Sarah Huckabee Sanders on Thursday rejected the notion President Donald Trump’s rhetoric helped inspire attempted attacks on his political opponents. White House press secretary Sarah Huckabee Sanders on Thursday bashed CNN after it faced a bomb scare the day prior, claiming the “first thing” it did in response to the treat was blame President Donald Trump. CNN reporters slammed Sanders for her comments. Sanders also claimed “90%” of the media’s coverage of Trump is negative. “The president is certainly not responsible for sending suspicious packages to someone, no more than Bernie Sanders was responsible for a supporter of his shooting up a Republican baseball field practice last year,” Sanders said, referring to the shooting that left Republican Rep. Steve Scalise critically injured. “We reported the news, in fact, and [anchor] Poppy Harlow and I can attest to that because we were on the air live” during the evacuation, he added. Sanders on Wednesday went after CNN after network president Jeff Zucker decried the president’s anti-media rhetoric. Sanders accused Zucker of being divisive after Trump called for unity in a statement earlier in the day. “The President, and especially the White House Press Secretary, should understand their words matter. Thus far, they have shown no comprehension of that,” Zucker said in a statement. On Wednesday, officials reported bombs had been sent or addressed to former President Barack Obama, former Secretary of State Hillary Clinton, former CIA Director John Brennan, former Attorney General Eric Holder, and Democratic Rep. Maxine Waters. On Thursday, officials said two suspicious packages addressed to former Vice President Joe Biden had been intercepted at separate mailing facilities and another package was found at actor Robert De Niro’s production company in New York City. Separately, a bomb was found Monday in the mailbox of billionaire George Soros, a prominent Democrat donor who has often been the target of right-wing conspiracy theories. Anyone with information on the packages is being asked to call the FBI at 1-800-CALL-FBI or go to tips.fbi.gov.